We looked online and discovered a staggering 25,810 customer reviews of Optimum Nutrition Gold Standard Whey 100%. Overall, this whey protein shake scored 4.6 out of 5. Users were pleased with the huge range of flavours, the high-quality ingredients and mixability. Some online buyers report that it mixes quite thin and that some flavours are too sweet. 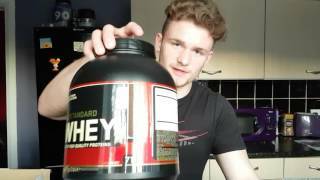 Regardless of the overall score, the sheer scale of reviews should tell you everything you need to know about this highly popular protein powder. These numbers speak volumes and support the fact that this is one of the best protein supplements of all time. I always avoided this protein due to the price, but having been able to buy on Amazon Prime day for a discount I was very surprised. I’ve had 4 flavours now and they are all really nice tasting. I mix the Whey with water and the Double Chocolate doesn’t taste great to me personally. That’s the only reason for the 4 stars. It does however seem to be doing the job, I drink after a workout and have noticed a decrease in muscle soreness the next day and it’s a great way to top up on protein needed. And to remain unbiased, here are some of the negative ones, too. As a shake with water it is fine and tastes ok but when I mix it in with my porridge it is not what a protein powder should taste/look like. I wish I bought my ‘standard’ cheaper protein powder that mixes and tastes well. Do not let the price fool you into thinking it is a superior product. As suspected, we found some reviews suggesting their product might have been fake. Again, in the interest of your safety, please check batch numbers and product info with ON Nutrition if you do believe you might have received a fake product. After using this for 4 weeks I started to notice more frequent headaches to which I started to look into the authenticity and according to their website the tubs should have batch numbers in blue at the bottom to which mine did not, it didn’t come with a vacuum seal nor the correct container. Pictures to prove – Stay well away! 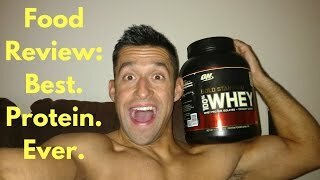 We found a shed load of videos for ON Gold Standard Whey for you to check out. There are some reviews, taste tests and all that lovely stuff, so hopefully, you find them useful. The primary ingredient in ON Gold Standard Whey is whey protein isolate – the purest form of whey protein on earth. As you would expect, this is a costly ingredient, which shows that no expense was spared manufacturing this super protein shake. Because of the purity, whey protein isolates contain almost no cholesterol and are lactose-free. This is great for those who are lactose intolerant, and those looking to manage their cholesterol levels. The above information is based on the Double Rich Chocolate flavour. It is worth noting that the nutritional content of each flavour differs slightly, as well as the number of servings per container. 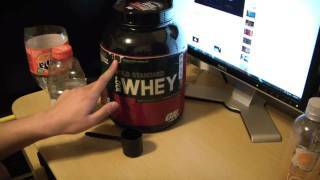 People commonly search for gold standard whey 5kg, but so far as we are aware, this size is not available. The debate regarding how much protein to take is still on. To help you better understand your requirements, Fitness Savvy has produced a unique protein intake calculator. Taking into account your fitness goals, how often you train, your body fat percentage, as well as other variables, this calculator provides a far more accurate number. The one gram per pound of body weight is a great rule of thumb and will work for the most part. However, those new to exercise won’t need as much, while those who are experienced, lean, and weigh more will naturally require higher levels. Gold Standard Whey packaging highlights that the product is instantised for easy mixing. It suggests adding one rounded scoop (30 grams) to 180-240 ml of cold water. However, when we used it, we found this to be very watery. We mix with around 100 ml of water, or 200 ml of milk, to produce a protein shake with more substance. On the label, there is also a suggestion to mix with oatmeal, yoghurt, or the milk you add to your cereal. It also recommends using Gold Standard Whey protein to increase the protein content of brownies, muffins and cookies by adding a scoop to your baked goods recipes. Due to its popularity, ON Gold Standard Whey is available from many outlets. The cheapest we ever found it was on Amazon, at just £35 for a 2.27kg tub! We certainly stocked up at that price. That said, Discount Supplements regularly have awesome deals on. As we’ve already mentioned, the primary ingredient in ON Gold Standard Whey is whey protein isolate. In addition to whey protein isolate, Gold Standard contains whey protein concentrate, and hydrolysed whey, too. To find out more about what each of these means, check out Fitness Savvy’s handy whey protein guide. If you want to see a full list of ingredients for each flavour, click on the “ingredients” tab to see. At Fitness Savvy, your safety is highly important to us. However, we are simply a price comparison platform and have no control over what products are stocked and distributed. While we work hard to ensure we only list products from reputable suppliers, there is always a risk that fake goods make their way into the supply chain. There are several things you can look for if you think the product you received was not genuine. But remember, companies constantly change packaging, labelling and ingredients, so it might be just the case the Optimum Nutrition has updated its packaging. Either way, if you are in doubt, the best thing to do is to contact ON nutrition in the first instance. Using the batch numbers on your item, they will easily be able to help you understand whether your product is genuine. If it turns out to be fake, do not consume any of the product. Return it to the supplier, along with any supporting information you can obtain from Optimum Nutrition to help you get a refund. Banana: Protein Blend (Whey Protein Isolates [Contains Emulsifier: Soy Lecithin], Whey Protein Concentrate , Whey Peptides ), Flavorings, Color (Curcumin), Salt, Sweeteners (Acesulfame Potassium, Sucralose), Enzyme Complex (Amylase, Protease, Cellulase, Beta-D-Galactosidase, Lipase). Chocolate Mint: Protein Blend (Whey Protein Isolates [Contains Emulsifier: Soy Lecithin], Whey Protein Concentrate , Whey Peptides ), Fat-Reduced Cocoa Powder, Flavorings, Creamer (Vegetable Oil, Maltodextrin, Milk Protein), Salt, Sweeteners (Sucralose, Acesulfame Potassium), Thickner (Cellulose Gel), Enzyme Complex (Amylase, Protease, Cellulase, Beta-D-Galactosidase, Lipase). Chocolate Peanut Butter: Protein Blend (Whey Protein Isolate, Whey Protein Concentrate, Hydrolysed Whey Protein Isolate, Emulsifier: Soy Lecithin), Whey Protein Concentrate , Whey Peptides ), Fat-Reduced Cocoa Powder (5.0%), Flavourings, Sodium Chloride, Sunflower Oil Powder (Milk), Sweeteners (Acesulfame Potassium, Sucralose), Enzyme Complex (Amylase, Protease, Lactase, Lipase, Cellulase). Cookies & Cream: Protein Blend (Whey Protein Isolates , [Contains Emulsifier: Soy Lecithin], Whey Protein Concentrate , Whey Peptides ), Flavorings, Cookie Biscuit Crumbs, Wheat Flour, Sugar, All-Vegetable Shortening, Reduced Fat Cocoa Powder, Salt, Raising Agent [Sodium Bicarbonate]), Salt, Stabilizers (Carrageenan, Guar Gum), Sweeteners (Sucralose, Acesulfame Potassium), Enzyme Complex (Amylase, Protease, Cellulase, Beta-D-Galactosidase, Lipase). Delicious Strawberry: Protein Blend (Whey Protein Isolates [Contains Emulsifier: Soy Lecithin], Whey Protein Concentrate , Whey Peptides ), Flavorings, Acidity Regulators (Citric Acid, Malic Acid), Color (Beetroot Red), Sweeteners (Acesulfame Potassium, Sucralose), Enzyme Complex (Amylase, Protease, Cellulase, Beta-D-Galactosidase, Lipase). Double Rich Chocolate: Protein Blend (Whey Protein Isolates [Contains Emulsifier: Soy Lecithin], Whey Protein Concentrate , Whey Peptides ), Fat-Reduced Cocoa Powder, Flavorings, (Acesulfame Potassium, Sucralose, Enzyme Complex (Amylase, Protease, Cellulase, Beta-D-Galactosidase, Lipase). Extreme Milk Chocolate: Protein Blend (Whey Protein Isolates [Contains Emulsifier: Soy Lecithin], Whey Protein Concentrate , Whey Peptides ), Fat-Reduced Cocoa Powder, Flavorings, Creamer (Vegetable Oil, Maltodextrin, Milk Protein), Salt, Sweeteners (Sucralose, Acesulfame Potassium), Thickner (Cellulose Gel), Enzyme Complex (Amylase, Protease, Cellulase, Beta-D-Galactosidase, Lipase). Vanilla Ice Cream: Protein Blend (Whey Protein Isolates [Contains Emulsifier: Soy Lecithin], Whey Protein Concentrate, Whey Peptides ), Flavoring, Salt, Sweeteners (Acesulfame Potassium, Sucralose), Enzyme Complex (Amylase, Protease, Cellulase, Beta-D-Galactosidase, Lipase).